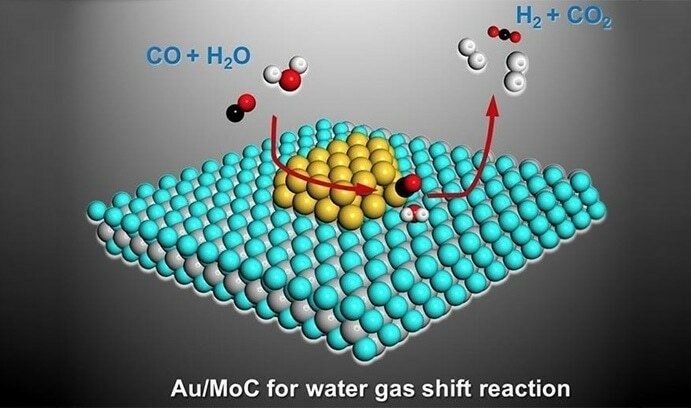 Writing in Science magazine, the team said its catalyst — consisting of raft-like gold nanoparticles on a particular type of molybdenum-carbide (α-MoC) substrate — had accomplished a high level of activity at low temperatures while generating the pure streams of hydrogen required to power fuel cells. The Scientists said they attained their results by employing the water-gas shift (WGS) reaction, in which carbon monoxide (CO) and water is converted into hydrogen (H2) and carbon dioxide (CO2). The team succeeded in purifying the hydrogen by consuming all available CO, which is likely to deactivate fuel-cell catalysts. Usually employed to make hydrogen for the manufacture of chemicals such as ammonia, the WGS reaction is also a crucial part of the attempt to transition from hydrocarbon-based fuels to hydrogen. Our reaction produces a stream of highly pure hydrogen which isn’t contaminated with CO, which if present would poison the catalysts within the fuel cell. We’re really excited by this development because it brings us a step closer to having cars that run on hydrogen fuel cells. According to Kiely, the use of the α-MoC substrate — a novelty by Ding Ma and his colleagues at Peking University in China — allowed the group to overcome limitations reported earlier with catalyzing the WGS reaction. It has long been known that gold supported on various oxide substrates could bring about the WGS reaction. The sticking point to date has been that generally the catalytic activity was too low and invariably the catalyst was not stable enough for long-term use. The paper’s Authors include Kiely, as well as Li Lu, a Lehigh Ph.D. candidate, and Wu Zhou, who received his Ph.D. at Lehigh in 2010 and is currently a Professor at the University of the Chinese Academy of Sciences in Beijing. The other Authors are associated with Peking University, Dalian University of Technology, Synfuels China and Taiyuan University of Technology, all in China, and Oak Ridge, Brookhaven and Lawrence Berkeley National Laboratories in the U.S. This work is headed by the Lead Scientist Ding Ma, a Professor in the College of Chemistry and Molecular Engineering and the College of Engineering at Peking University in Beijing. In order to achieve high catalytic activity at low temperature (that is below the 150 ºC required to efficiently operate a fuel cell), the team disseminated the gold onto a carbide (α-MoC) instead of the cerium oxide, iron oxide or various other reducible oxide substrates that was earlier tried for the WGS reaction. When compared to traditional catalysts, the new catalyst formulation proved to be more stable, while accomplishing much better activity, a measure of a catalyst’s effectiveness. The beauty of the α-MoC support is that it can activate the water so that it creates active surface hydroxyl (OH) species, which can then react with the CO to give hydrogen and CO2. The carbide support therefore plays a very strong and critical role in this reaction. This system works very well at the temperatures and pressures needed for fuel cell applications and its activity is an order of magnitude better than that of previously tried gold-based catalysts. The team showed that the gold exists in two different forms on the α-MoC support, in the research performed using Lehigh’s aberration-corrected scanning transmission electron microscope (STEM). Besides publishing four articles in nature, this is the ninth article Kiely has published up to now in Science. The two publications are believed to be the world’s most important science journals. Kiely received one of the highest honors in his field, earlier this month, when he was inducted as a Fellow of the Microscopy Society of America. Every year, the MSA Fellow designation acknowledges senior renowned members of the society whose service and achievements have made noteworthy contributions for the advancement in the fields of microanalysis and microscopy. In addition to directing the internationally renowned Lehigh Microscopy School, Kiely, is the fifth faculty member in the history of Lehigh’s department of materials science and engineering to be elected as an MSA Fellow. The others include J. Alwyn Eades, Charles E. Lyman, David B. Williams and the late Joseph I. Goldstein.